Music composer turned hero G V Prakash is on a roll with his first two films Darling and Trisha Illana Nayanthara doing well at the box office. Some time back he had announced his next project titled Bruce Lee that would be produced by Kenanya Films and directed by Prasanth Pandiyaraj with Kriti Kharbanda as the heroine. 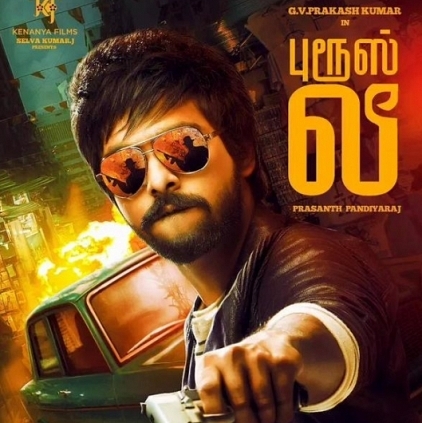 The first look poster of the film reveals a stylish Prakash with uber cool shades, holding a gun, appearing to be ready for an action scene. The film commenced today on the auspicious day of Maalaya Amavasai with a customary Pooja. Bruce Lee is said to have Mundasupatti Shankar wielding the camera. Other cast members of the film include Balasaravanan, Mundasupatti Ramdoss, Motta Rajendran and Mansoor Ali Khan. It is reported that the shooting will take place in one single schedule and the team plans to release the film for 2016 Valentine’s Day. It’s going to be Vikram and Vijay Sethupathi! Gv Prakash To Romance Nayanthara In Bruce Lee. People looking for online information on Bruce Lee, G V Prakash, Kriti Kharbanda will find this news story useful.